Free skating for the whole family at the Robson Square Ice Rink! Skate rentals are available for $4.00. Rentals end 30 minutes prior to close. Helmets are mandatory for children 12 years and under. 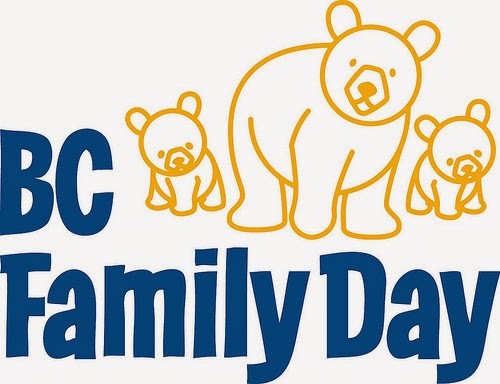 British Columbia’s second Family Day will be celebrated with savings for parents and kids at the Peak of Vancouver. Amazing activities, and lots of fun for the whole family. Celebrate Family Day by partaking in art activities, heritage games and unlimited carousel rides! Children under 15 must be accompanied by an adult. Admission is $6.50 per person ($5.85 per member). Family active gym programs for all ages. Tot Romp in AM and 6yrs+ in the afternoon. February 10, 2014: Family Day Pancake Breakfast & Indoor Playland! Queensborough Community Centre’s “Family Day Pancake Breakfast & Indoor Playland!” is a fabulous and free way to help families get focused on Family Day! Participants can enjoy a delicious pancake breakfast followed by our infamous ‘indoor playland’. Children have the opportunity to jump, tumble and bounce on gym equipment and bouncy castles. Free family fun activities will also include face painting, crafts and high energy games. February 10, 2014: Families Do – Gym-A-Zoo! Its a Zoo of a good time at Family Gym Time at Hyde Creek Recreation Centre. Offered in partnership with OPTIONS Community Services. The intent of our Health Hearts Family Day is to celebrate family and community where all are active and engaged for life. The event will feature family friendly sports, open ended art activities, pancake breakfast and yogurt breaky bar. Families will be encouraged to take care of their hearts…both physically by being active and emotionally by sharing time together and with community.